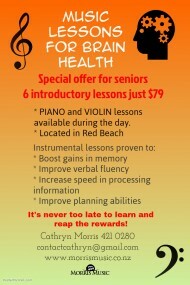 Welcome to the Morris Music Studio in Red Beach on the Hibiscus Coast, home of violin and piano tuition for all ages. 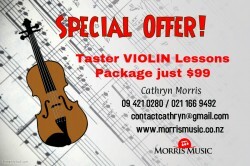 My name is Cathryn Morris, I am a passionate violin teacher and piano teacher who delights in seeing my students of all ages achieving and enjoying musical success. Whether you are a complete beginner, are now moving on to more advanced study or returning to an instrument after a long break I can help you to reach your musical goals. 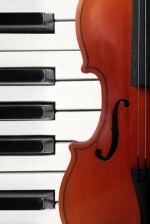 My individual approach to teaching has helped many students of all ages over the past 30 years to realise their potential and often exceed their own expectations as they have easily mastered a sound technique, understood note reading and musical theory and found enjoyment making beautiful music. Please phone me with any queries or to book a slot in my schedule on 09 421 0280 / 021 166 9492 or register for lessons using the registration page. Alternatively you can send any questions to me using the contact form. Let me know your aspirations and together we can work to make them a reality! Ben Lan took out the Diane Webster Musicianship Trophy at the Hibiscus Coast Music Teacher's Festival in August. Way to go Ben!